When it comes to learning something new, we all need to start somewhere. In our Top Picks for Beginners series, we will take a look at the features of selected products and talk about what they have to offer you as an aspiring player. In this article we will be looking at drums! TOURTECH Drums are an excellent choice for the beginner! They have tons of sounds, songs and other features on board. The TOURTECH TT-12S is a great introduction to the product line, with 250 different voices and 20 demo songs to practice with on board. It features 7 quality rubber pads, with a dual zone snare and solid-feeling pedals for kick and hi-hat control. There is also an aux input to connect an MP3 player and jam along with your favourite bands. Combine that with stereo outputs, a separate headphone port and MIDI connectivity and you have one feature-packed kit! The TT-12SM is much the same kit as the TT-12S, but upgrades the playing experience with a Mesh Snare pad and a rubber kick pad and pedal. Mesh pads have a more realistic playing response, and have less pad noise when struck than their rubber counterparts. Both kits are excellent for the beginner and have so much to offer! Kicking things up a notch from the TT-12 models, the TOURTECH TT-16S brings much more sounds, utility and response to the table. With a staggering 458 different voices, 8 high quality rubber pads, choke functions on the cymbals and much more, the TT-16S has plenty to offer the beginner and seasoned player alike. You can tune the samples, add reverb and use EQ to get your desired tones from the kit. This is a superb option! 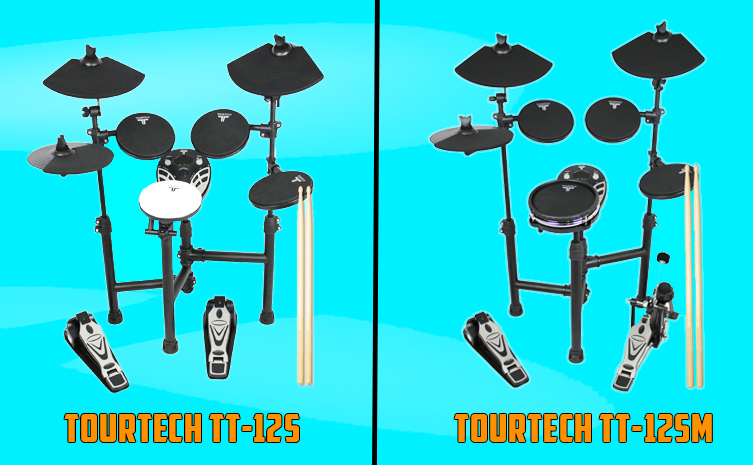 TOURTECH's flagship TT-22M model is truly the ultimate kit for beginners. It features all Mesh Dual Zone pads, which can be 'tuned' to get the tension right, just like on an acoustic kit! It boasts 458 high quality sounds, 20 demo songs and EQ and effects. There's a choke function on the cymbals, an Aux Input for connecting an MP3 player and jamming to your favourite artists and plenty of other features. This is the kind of kit that's straightforward enough for starting out, but has enough to offer that it will last you for years to come! Roland is a brand name that has long been synonymous with high quality music equipment. Their legendary V-Drums have been relied upon by drummers beginner and professional alike for decades. The new TD-17 features Roland's best sound modelling engine to date, which is derived from their flagship TD-50 kit. Able to faithfully recreate acoustic drum sounds as well as featuring electronic kits, the sound and playing response you get from the TD-17 is unreal. The TD-17 is designed so that you can transition between an acoustic kit and an electronic kit without having to change your playing style. This is great for developing your technique, as you aren't constantly having to adapt it between lessons/band rehearsals/gigs and practice sessions. Combine that with a wealth of on board coaching and practice functions and you'll be on your way to becoming a pro in no time! The TD-17 is available in 3 different models with varying features. Let's take a look at what they each have to offer. The TD-17K-L is the entry model to the line. It features an 8-inch mesh snare, 3 high quality rubber tom pads, cymbals with choke functionality and their new KD-10 kick pad. 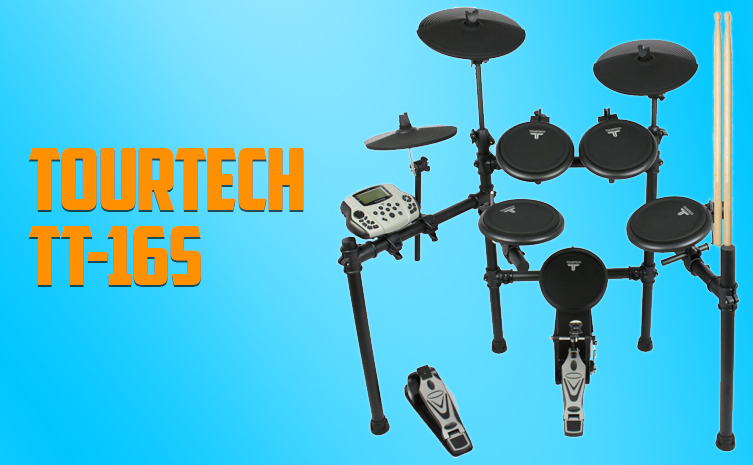 This kit is excellent value for money and a perfect entry into the world of V-Drums. The TD-17KV expands upon what the TD-17K-L has to offer and adds Bluetooth audio into the mix. This makes it really easy to stream your favourite songs through the kit's sound module and jam along. This is also particularly handy for watching lessons online and hearing the audio through your headphones while still hearing yourself play. The pads on the kit have also been upgraded to feature a 12 inch double-mesh snare and 3 mesh toms. This greatly improves the playing response of the kit and lets you hit those ghost notes much easier. We highly recommend this kit as a super high quality, realistic feeling and sounding option. Expanding further upon features in the other two models, the TD-17KVX incorporates Roland's VH-10 Hi-Hat. The VH-10 behaves and responds very much like an acoustic one would, and works with a proper Hi-Hat stand (sold separately). This is optimal for learning good hi-hat control and being able to translate it over to an acoustic kit seamlessly. There is also an extra crash cymbal thrown into the mix, giving you more options. This is the ultimate practice kit for beginners and advanced drummers alike! We hope this helps you better understand what kits are available and what each one has to offer you. There's just one more thing we want to talk about, and that's accessories. We can't have you opening up your new kit and realising you don't have anything to listen to it with! It wouldn't be nearly as much fun if you had to hit the drums with your bare hands, would it? You're going to need some drum sticks! All TOURTECH kits come with a free pair of drum sticks in the box, so you're covered if one of those kits are your choice. If one of the Roland kits is more to your liking, we recommend a pair of Pro Mark Hickory 5A sticks to go with it. One of the benefits of digital drum kits, is that they can be as quiet or as loud as you need. This does mean they require an amplifier or a set of headphones to be heard. We recommend the TOURTECH TT-PSM5 monitor, which you can plug your kit into, as well as an MP3 player and other instruments for jam sessions! With headphones you can quietly practice your new craft without annoying the neighbours. It's worthwhile getting a comfortable pair that provide good sound quality. Roland RH-5s are a solid pick to complement your new kit. You'll need a comfortable seat which you can set at your ideal height. A great option that we recommend is the TOURTECH TT-DT32C Double Braced Drum Throne. All of the Tourtech kits come with a kick pedal in the box, but you'll need to get one separately if you decide to go for a Roland kit. The Tama Iron Cobra HP200P is a totally solid pick! While we hope this article gives you the knowledge you need to choose the right kit for you, we understand you might still have some questions. Our friendly staff are very knowledgeable and will be happy to advise on anything that you're unsure of. Please get in touch if you have any questions!